It’s been five years since Massive Open Online Courses first emerged, and since then they’ve become a popular option for those who already have a traditional education, but are looking to keep their learning going and enhance or update their current skill set. In fact, one study found that the typical MOOC student is older than the traditional college age, already has a bachelor’s degree and is already employed. For these working professionals, MOOCs are a great way to advance in their current career or prepare for a career change. 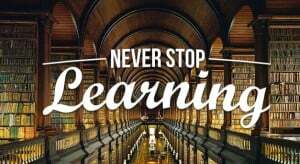 Research shows that 73% of adults consider themselves lifelong learners, and 63% are ‘professional learners,’ which means they’ve taken a course or received additional training to improve their job skills. Of these learners, 65% say their learning has expanded their professional network, 47% say it helped them advance within their current company and 29% say it helped them find a new job. So if you’re currently on the lookout for ways to develop important transferrable skills like communication and time management, or even lifelong learning skills like critical thinking that will help you become a better learner in general, here are ten MOOCs that could be worth your time. The ability to innovate and solve problems using your creativity is important whether you work in IT or human resources, so if you’re looking to develop in this area, one MOOC that could help is Creative Problem Solving, a course created by the University of Minnesota and delivered by Coursera. The course focuses on divergent thinking and consists of creativity building exercises, lectures, and readings. Its primary aim is to help you recognise your limits and then overcome them by moving out of your comfort zone. Having a growth mindset, means you believe you’re capable of growing and improving, as opposed to believing your abilities and intelligence are fixed. Research shows that we can benefit from a growth mindset because it encourages us to seek out new challenges and opportunities and increases our motivation to learn. If you’re interested in developing a growth mindset, the Udemy course Achieve a Growth Mindset Today could be a great place to start. It’s designed for individuals looking to make a change and covers everything from ditching bad habits and creating new ones to developing resilience. Time management is another valuable skill to have in just about every industry, and the Coursera-delivered course Work Smarter Not Harder could help you improve in this area by providing you with a better understanding of the most effective time-management tools, methods, and techniques. The course was created by the University of California, Irvine and consists of 4-8 hours of videos, readings, and quizzes that will help you improve your ability to set goals, prioritise your time, schedule activities, and delegate in order to enhance your productivity. Communication is consistently rated as one of the most important soft skills by employers across all industries, so brushing up on your verbal and written communication skills is always a good idea. Business Fundamentals: Effective Communication was developed by The Open University and delivered by FutureLearn. It focuses on essential skills such as writing reports and proposals, conducting productive meetings both virtually and face-to-face, and learning to recognise cultural and personal differences and then tailoring your communication to suit the occasion. With the rise of fake news, an ability to think critically and evaluate information for accuracy and objectivity is more important than ever. If you want to enhance your critical thinking and research skills, Critical Thinking in Today’s Communication is an excellent place to start. Created by the Maastricht School of Management in the Netherlands and delivered by MOOC provider Iversity, this course aims to help you analyse the truth of different kinds of statements and covers everything from the structure and analysis of arguments to cognitive biases and the use of emotional tools in persuasion. Search Engine Optimisation skills are in high demand these days, and SEO/SEM marketing skills even found their way onto LinkedIn’s list of top skills that can get you hired in 2017. If you’re still pretty new to SEO but would like to understand its ins and outs, Search Engine Optimisation Fundamentals delivered by Coursera could be worth your time. The course was developed by the University of California, Davis and provides an overview of how search engine algorithms affect search results and websites. In addition to this, you’ll learn how to select effective keywords, identify ways to improve a website’s SEO, and much more. Although you may not always be aware that you’re doing it, negotiation is a skill you probably use on a regular basis, whether you’re negotiating your salary with a new employer, resolving conflicts in the workplace or at home, or looking for ways to increase profitability. If you want to improve your negotiation skills, a University of Michigan MOOC called Successful Negotiation: Essential Strategies and Skills, teaches the four steps to a successful negotiation, from planning your negotiation strategy to performing and evaluating. Even if you don’t work in finance, having an understanding of basic finance and accounting concepts is always useful, especially for small business owners and entrepreneurs. Finance for Non-Financial Professionals is a course developed by the University of California, Irvine specifically for those who are looking to improve their general financial knowledge. The course will teach you how you can affect the profitability of your organisation and help you gain a better understanding of everything from forecasting and budgeting to cash flow. Both data presentation and data mining are on LinkedIn’s list of top skills that can help you get hired in the future, so if you’re as yet unfamiliar with data science or want to learn more about it, you could consider Data Science Essentials, an edX course developed by experts from MIT and Microsoft. The course will introduce you to machine learning and help you understand the data science process, probability and statistics in data, data exploration and visualisation, and much more. Leadership is another highly sought-after skill, and according to an analysis of over 2 million LinkedIn profiles, employers are placing more value on soft skills like communication, teamwork, social skills, and having a friendly personality. So if you’re hoping to step into a new role or get promoted this year, refreshing your understanding of what it takes to be an effective leader and influencer could be useful. Leadership and Influence is a Coursera course developed by the University of Illinois with the aim of equipping individuals with the tools they need to influence the course of their future. It covers self-assessment and leadership planning, negotiation, resolving conflict, and dealing with difficult people. Of course, this list only scratches the surface when it comes to MOOCs that can help you grow your skill set and advance in your career, so if you’re looking to develop skills that aren’t mentioned here, do some digging at MOOC List, where you can find MOOCs by keywords, universities, or type of certificates. Really i inspired to read this piece of content,which you mention for enhance skills set for communication and time management, or even lifelong learning skills , in every one follow these points in life to make their mind creative and knowledgeable .Students always follow these things to achieve their goals in their educational life like in research or in professional life . Hope i will read more post again. Thanks a lot for sharing the list. I’m a kind of MOOC addicted and found lots of themes to go ahead. That’s a great list Marianne. I’d venture to add my own MOOC to the list, Experimentation for Improvement. It follows a similar theme to the 10 MOOC’s you have mentioned above. Thanks for this list! Prior learners have used it to improve learning a language, engineering systems, increasing sales, and more. These examples are used in the quizzes. Thanks for sharing Marianne – a great list. A MOOC that could have got a mention here is ‘Learning How to Learn’ by Barbara Oakley – it was fantastic! and make it an unordered list. MOOCs can be helpful for lifelong learning only if they are the same as oncampus course . Otherwise it is useless and have no academic value atg all . Unfortunately some schools just provide a cheap version of their courses . Thjey should stop it . Otherwise they will lose their dignity . Nobody can say that they have good value at all .